What could be better than a beautiful home in New York City? 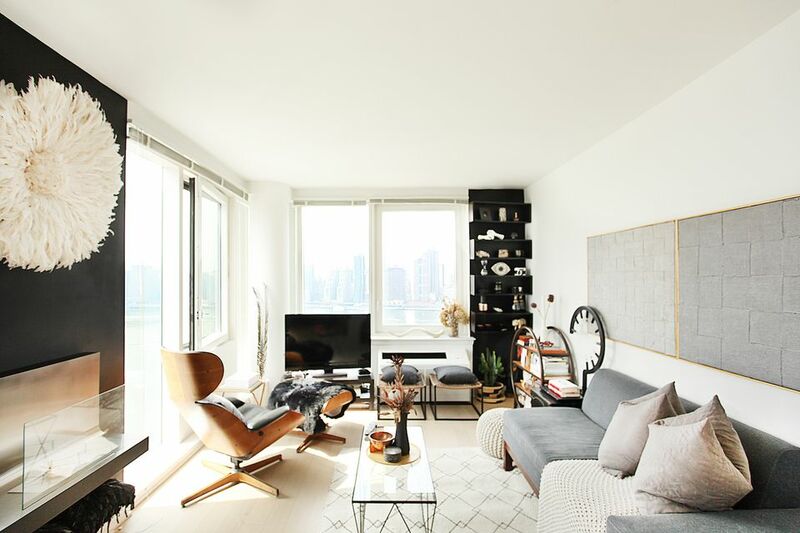 A beautiful home in a high rise building with views of the East River, Manhattan and Brooklyn. That's the home of interior designer Tanika Goudeau-Hochhauser, co-founder and principal designer of De.psy.n (pronounced, "design"). The space is a designer's dream come true and Tanika hasn't wasted a single opportunity to make the house that she shares with her husband, Brian, feel like a very stylish home. The living room is where Tanika's design expertise really shines. Taking advantage of the large windows which fill the room with light, the designer opted to keep the color palette simple. The fundamentally black and white color scheme is accented by a balanced array of colors from the cool gray of the sofa to the warm brown tone of the Eames lounger. The result is a sophisticated and relaxed environment that's perfect for unwinding after a hectic day in the city. One of this room's most charming touches is the way that it blends elements between different parts of the room. Here, the wall art that hangs above the sofa is made of the same material as the upholstery. Having the texture of the sofa on the walls give the room an added touch of comfort. This area also shows the room's subtle blending of warm and cool colors as the cool, gray couch is surrounded by warm wood tones on the end tables and the wall art mixes the color of the frame with that of the art. This book shelf is one of Tanika's favorite pieces in the home. The couple felt a need for more storage and also needed something to infuse the space with more personality. They found the solution to both problems by creating this shelf out of raw wood and paint. Now it's home to the pair's collection of beloved sculptures, cameras and other assorted odds and ends. Infusing culture into a space is always a sure way to bring a new level of sophistication to a room. Here, a stylish, white Juju hat hangs over a modern fireplace unit which the couple also installed by hand. The juxtaposition of traditional and contemporary influences is striking and deepens the tone of the space. A moment of mid-century luxury in the middle of a decidedly modern space, this Eames lounge chair is Tanika's gift to Brian. Strategically placed just in front of the home's large windows, it offers a comfortable perch from which to enjoy the full range of the home's commanding view of the river. Art hides around every corner in this home, often gathered together in small, intriguing groups. At the bar, a selection of covered bottles and small carvings from South Africa add a bit of color to the neutral backdrop of the kitchen's warm wood finishes. A mounted basket in the background enhances the cultural statement. The hall contains some of the couple's antique finds. Burnished, metallic, Moroccan lanterns sit atop an antique Chinese chest. Above them on the small floating shelf sits an assortment of carved, oversized Scrabble tiles. All of the pieces were used as part of the decoration for the couple's wedding. They continue the celebration now as a meaningful part of their home decor. Black walls in the bedroom have been a growing trend for the last few years and in this room it's very easy to understand why. Having a dark shade on the walls in the bedroom is an excellent way to make everything else in the space pop. Even the latticework of the headboard, which is black as well, stands out against the wall, as does the colorful Hmong pillow that sits at the head of the bed. Off to the right, a giant ampersand is another wedding memento that the couple likes to keep close. It's always nice to have people with artistic talent in the family and here, Tanika makes good use of her family's abilities. The illustrations atop this dresser were all composed by a cousin of the designer. Depicting all of the members of the household, including the family dog, along with an image of the artist herself, this vignette is a beautiful reminder that decor is about more than trends and furniture, it's about surrounding yourself with things that are meaningful to you and people that you love.